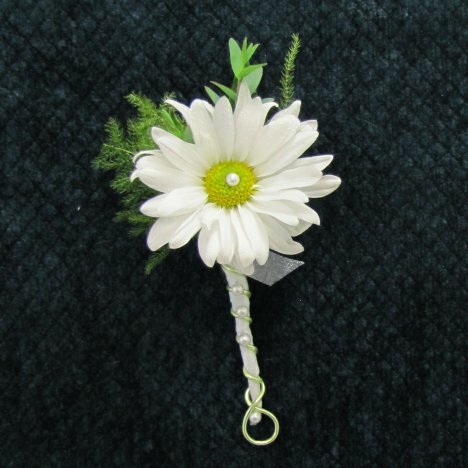 This daisy boutonniere finished with a cool wire wrap. 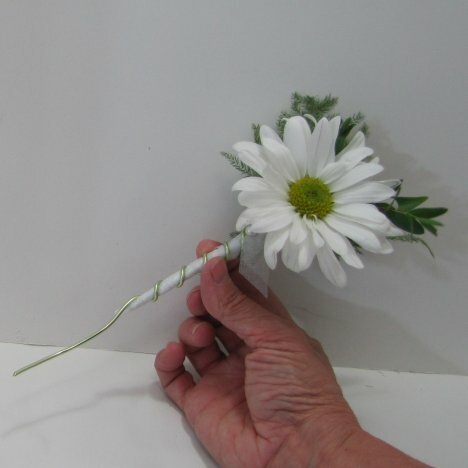 Cut the wire off at the bottom of buttonhole flower, leaving a tail that you can curl up. I gave the wire a twist, creating a decorative loop at the bottom as a pretty finish and tucked the end up behind the boutonniere. After safely shortening your pins, you can use them in different ways to enhance your boutonniere design. Here I inserted a pearl pin in the center to conceal where the wire hook is buried. 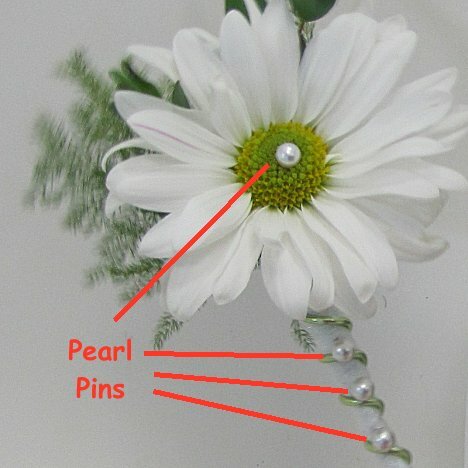 I also cut the stems very short on more pearls, dipped the points in floral adhesive (or white glue - both will work) and inserted in an upward angle in the boutonniere stem between the wire wrap. This is the type of touches that give your boutonnieres a polished, professional look. Just imagine how much you can save by comparing this simple design with what professional flowers shops charge for boutonnieres. FTD boutonnieres can cost you $150 or more for 6 boutonnieres! These are really easy to do - and still have the expensive look while saving you quite a bit on your flower budget. 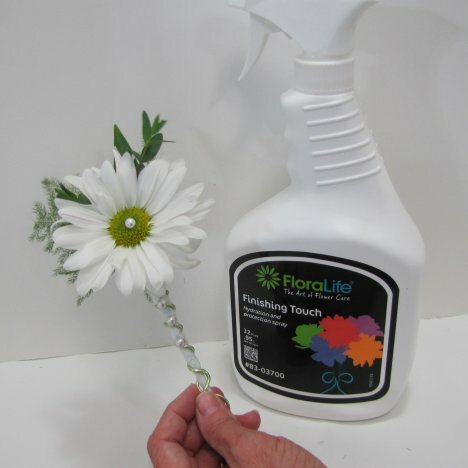 I complete this daisy boutonniere tutorial by spraying every flower with a sealant such as Finishing Touch. This helps keep the petals hydrated even though they don't have a water source. See how beautiful even a simple flower like a daisy can be when you take care with all the small details. Everything from different foliages to ribbon, wire and pearl detailing add a custom look to a design that would warrant high prices in a professional shop. 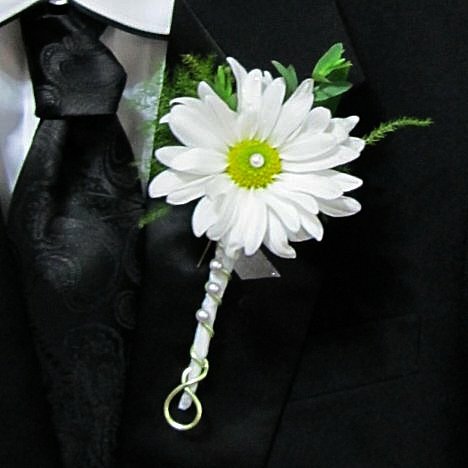 The flower is then fastened to the wearer's left lapel (right side of the person pinning on the boutonniere). 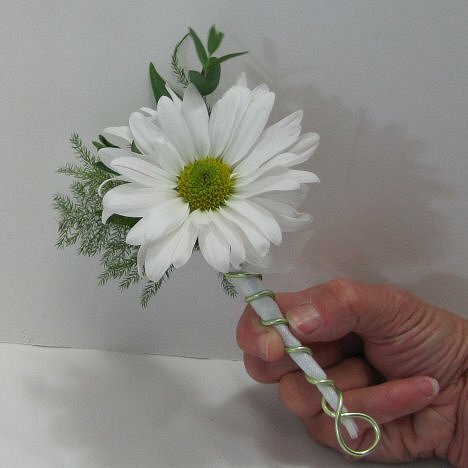 If you use traditional pins to secure the posy, be sure to pin from the backside and bury the sharp points into the flower head. This will keep it secure and safe to wear. Alternatives such as Boutstix or Easy Pins have to be worked into the design while creating the bout.